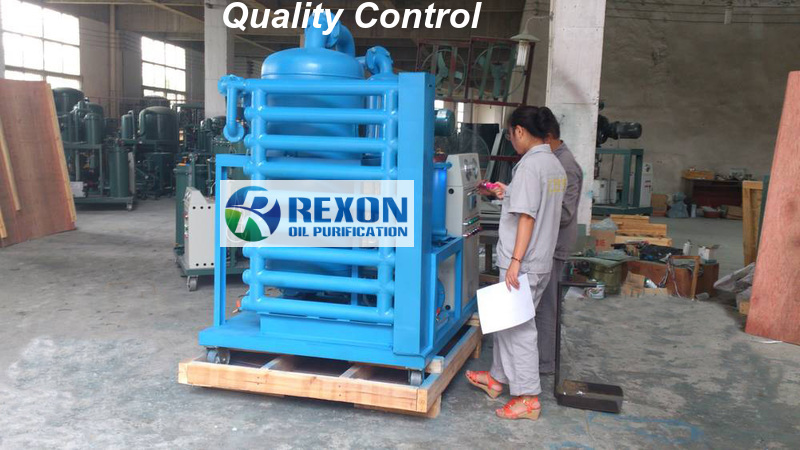 Every oil purification machine produced by REXON company will be strictly quality tested, and inspected, and quality controlled. After each oil purifier finished production, the first step is to test each part of the oil purifier, every components like vacuum chamber, we will test it’s vacuum degree, and sealing situation, vacuum oil dehydration efficiency etc. And same to the filtering system, which contains 3 filters normally or 2, or more. And electric control system, every button and touch screen’s operating sensibility. Vacuum gauge, pressure gauge, and so on. Next we will test the whole machine’s working status and efficiency. We will run the machine over 3-5 hours each time for the testing, if any problems found in this procedure, we will fix it and make it 100% good and new of the components and guarantee the machine working performance, make sure every machine from REXON is high reliable for years use. And after that, the machine will get a quality testing certificate from our factory, and only the machine has this certificate, it can be allowed to delivery out. Finally after the quality inspection, we will check out the machine’s appearance, if any defect like painting failure or wires arrangement not good looking, we will repainting, and make everything right and standard. So every oil purifier machine you purchased from REXON is under strict and high standard quality control, we give the warranty for machine quality and warranty time is 2 years. Welcome to contact us for oil purification machine any time, we sincerely hope to cooperate with our world-wide customers and make a long and win-win relationship with each other!